A Republican senator criticized by an aide to the lieutenant governor came back with a rebuke — a jab that cost him his best committee assignment. There's a lesson in that for the other 30 senators, and a new landscape in the Senate. You think politics is tough in your office? Consider the case of Kel Seliger, a Republican senator from Amarillo. As of Tuesday afternoon — and for the first time since his first term in the Senate 16 years ago — he is neither the chairman or vice chairman of any committee in the Senate. Seliger got busted — legislative parlance for losing a choice assignment — when Patrick made committee assignments last week. He was removed as chairman of the Higher Education Committee, removed from the budget-writing Finance Committee and taken off the panel on public education, and given the chairmanship of the newly created Agriculture Committee. 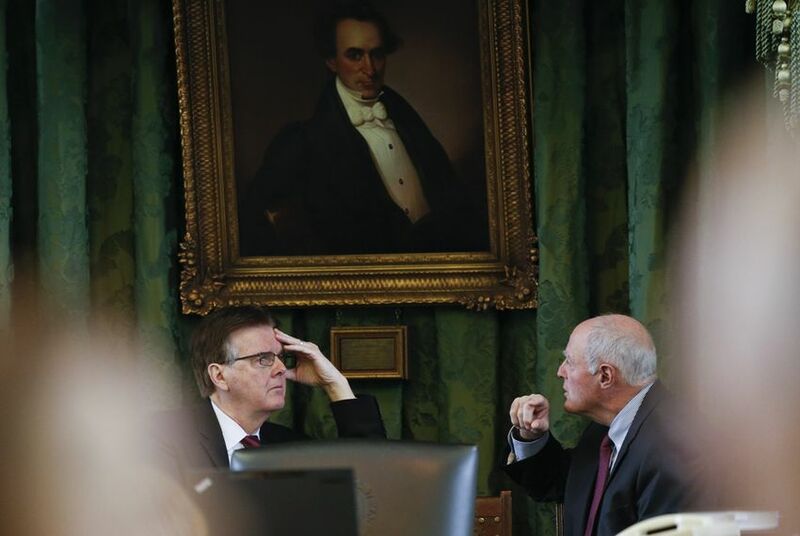 He told The Texas Tribune’s Emma Platoff last week that “it’s not what I desired” and added that he thought it was the lieutenant governor’s retaliation for votes against a couple of Patrick’s priorities during the 2017 session. One of those, according to Seliger, was for public funding for private schools — vouchers — and the other was a proposed state limit on how much cities and counties can raise taxes without voter approval. Local officials opposed that idea, as did Seliger, a former Amarillo mayor. Seliger then did an interview with Lubbock radio host Jay Leeson, who asked him about Sylvester’s comment. Not enough, as it turned out, for Sylvester’s boss. Seliger’s back end is no longer destined for a chairman’s seat. “I met with Sen. Seliger earlier today and gave him an opportunity to apologize for a lewd comment he made on radio about a female staffer that has shocked everyone,” Patrick said in a news release. “He had 48 hours to apologize, but failed to do so. He has refused to take responsibility and outrageously, blamed the staffer and said she should be fired. To not be willing to apologize and suggest, somehow, that she had it coming is unimaginable. I will appoint a new Agriculture Committee chairman shortly." Seliger apologized later, in his own fashion: “In hindsight, I should have directed my response to the lieutenant governor and not to his messenger. And for that I apologize. Patrick's actions Tuesday weren't just a message to Seliger. The other 30 senators were watching closely, getting the word that a wayward vote would cost them — and their constituents — dearly. It’s not the first time the lieutenant governor has moved to punish a senator from his own political party; it’s not even the first time he’s busted a Republican senator during the current legislative session. Charles Schwertner of Georgetown lost the chairmanship of the Health and Human Services Committee after allegations he sent lewd texts to a college student. He also lost his seat on the Finance Committee. And last year, Patrick went after former state Sen. Craig Estes, R-Wichita Falls, supporting then-state Rep. Pat Fallon of Prosper over Estes in last year’s GOP primary. Estes, who also said he was targeted because of his votes against the lieutenant governor’s pet legislation, got just 22.6 percent of the vote in his re-election bid. Fallon, by the way, was named to these committees for his freshman session: administration, education, intergovernmental relations, natural resources and economic development, and state affairs. A less enthusiastic electoral attack on Seliger fell short. Allen Blakemore, a political consultant and lobbyist who counts Patrick as his most prominent client, ran last year’s campaign for Victor Leal, a restaurant owner and erstwhile legislative candidate from Muleshoe who challenged Seliger in the Republican primary. That was either a signal that Patrick doesn’t control his consultants, or that he does. If you don’t know what he was thinking, you can’t answer that question. All you can say is that his consiglieri put the arm on a senator who crossed Patrick, that Patrick himself said he wasn’t involved, and that Patrick punished Seliger after he survived the hit. And on Tuesday, he punished him some more. That removes Seliger’s incentive to cast any loyalty votes on Patrick’s behalf, and that could be a meaningful change. The Seliger spanking could undo one of the Texas GOP’s most important electoral wins in 2018, when Republican novice Pete Flores, who had never held public office, beat several Democrats to win what had been a Democratic seat along the Texas-Mexico border. That special-election victory gave Republicans room for the two-seat loss they suffered in the November election; when it was all over, they maintained a one-vote procedural majority over Democrats, one that would allow Republicans to bring up legislation without Democratic cooperation. That majority was 19 Republicans to 12 Democrats. Seliger lost his chairmanship, but Patrick left the Amarillo Republican with little left to lose. There’s a new vote count in the Senate: 18 to 12 to Seliger. Disclosure: Allen Blakemore and Sherry Sylvester have been financial supporters of The Texas Tribune, a nonprofit, nonpartisan news organization that is funded in part by donations from members, foundations and corporate sponsors. Financial supporters play no role in the Tribune's journalism. Find a complete list of them here.